It’s important to consider a number of factors, including where, why and how you fly to get the perfect aircraft. Ensuring that a client has the aircraft that will best serve his business and personal needs is a responsibility we take very seriously at DJI. There are many brokers that are knowledgeable about various makes and models of aircraft, but we pride ourselves on putting the focus where it belongs- on the people and the company the aircraft is intended to serve. To make the best match, we start with a series of questions about personal and business objectives and preferences. The first consideration (as probably expected) is the budget. Besides the obvious question of what is available to spend on the acquisition of the aircraft, we also want to know preferences for ongoing expenses. Depending on cash flow and timing considerations, sometimes it’s preferable to spend more on the acquisition of an aircraft that will have lower direct operating costs, or vice versa. In this example, Aircraft B is a newer aircraft which may cost more to acquire but has lower direct operating costs because of fuel efficiency improvements and a longer time before engine overhaul and other major expenses. In some cases, we may advise a client they don’t need to spend as much as they had expected to, depending on choices they will make. How many people will travel in this aircraft most of the time? While there are always exceptions, it is good to know what the “typical” passenger complement would be. If the typical passenger contingent is 2 people, a smaller aircraft would be comfortable. If the usual party is four or five, then we’d be looking at midsize cabins. For eight to ten people, we would look at large cabin sizes. This is a consideration that might affect cabin size or luggage configuration. For a client that frequently takes a group to golf in Scotland, we need to ensure that there is convenient space for golf clubs. Other considerations are camera crews that require a lot of camera and lighting equipment, clients that may need to carry industrial parts of various sizes, or skis (some aircraft have factory installed ski tubes or other conveniences.) We also need to consider the size and placement of doors to ensure your equipment can be safely and conveniently loaded and unloaded. We once experimented with four folding bicycles for one buyer that wanted to be sure that they could travel with them. It is important to ensure that the aircraft will accommodate whatever you need or want to travel with. We need to know where the aircraft will be based and the frequent and expected destinations so that we can choose an aircraft with the appropriate range and other characteristics. Traveling predominantly in one region could require a shorter-range aircraft than one that needs to travel coast-to-coast or internationally on a regular basis. We also want to know if you travel frequently to high-altitude destinations like Aspen or Telluride. 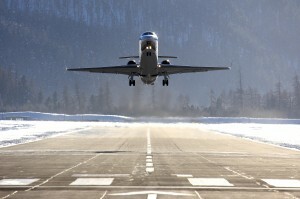 Although some aircraft are designed to perform well at those altitudes, some will need to take off in the morning or evening , (high temperature exacerbates the effect of high altitude on engine performance) or take off “light” at the high-altitude airport, then stop in Pueblo, Denver or Grand Junction to fill up with fuel. As an example, if you anticipate needing to leave and arrive at very high altitude or very hot airports at any time of the day and don’t want to be dependent on favorable weather conditions, we need to take those factors into consideration. We also need to consider your destinations to ensure adequate runway length for your aircraft. Short runways, (4500 feet or less) usually in smaller or more remote airports are also a consideration. Some aircraft need a longer runway to take off and land safely under many conditions. How fast do you need to get there? This is most often a function of how often you are willing to stop for fuel. Few of our clients care about the time difference between an aircraft that flies at 300 vs. 400 knots. Many brokers represent one or two major aircraft manufacturers. We remain independent and are free to recommend the best aircraft for your needs and preferences. Both Shawn Dinning and I are type-rated pilots in most of the aircraft listed, and can help you make a choice you will be very satisfied with. Here are a few of the aircraft that we place frequently. You are currently browsing the archives for the Models of Aircraft category.